We offer quick towing, roadside assistance, unlocks, jumpstarts and more in Sioux Falls, SD! All American Towing provides service for some of the top national roadside assistance companies, best auto repair shops in Sioux Falls and surrounding area, as well as private individuals. All American has operations located in Sioux Falls and Tea, South Dakota. We've towed everything from car frames to tractor trailers; light duty, medium duty and heavy duty, you name it we’ve more than likely towed it. We also assist multiple law enforcement agencies with their towing needs, property owners with their vehicle removal needs, as well as financial institutions with their property recoveries. At All American Towing, Sioux Falls we value your car and your time. We treat your car like our own, our employees have a high level of customer service and we make every effort to be on time so you can plan your day. All of our employees are uniformed for easy identification and all of our trucks are non-smoking for the comfort of all customers that ride with us. There's no length that we won't go to for our customers. You can trust All American Towing to provide professional service and fair prices. We are Nationally TRAA Certified and Law Enforcement Authorized Towers. We also donate vehicles to the local fire department for training purposes and the local school district for automotive education. Breakdowns and accidents can't always be avoided. We hope all of our customers drive safely and responsibly, but you can't always count on your fellow drivers to do the same. 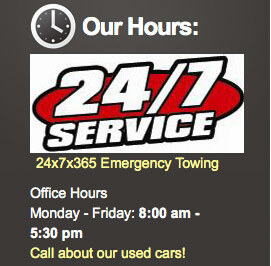 When you find yourself in need of a tow or roadside assistance in the Sioux Falls area, please remember us. Or better yet, save our phone number in your cell phone, because in the heat of the moment you may not be able to recall it.